Globally, tropical coral reefs are being degraded by human activities, and as a result, reef-building corals have declined while macroalgae have increased. Recent work has focused on measuring macroalgal abundance in response to anthropogenic stressors. To accurately evaluate the effects of human impacts, however, it is necessary to understand the effects of natural processes on reef condition. To better understand how coral reef communities are influenced by natural processes, we investigated how spatial and seasonal changes in environmental conditions (temperature and PAR) influence benthic community structure, and the composition and frequency of coral-algal interactions across eight distinct zones and over a 23-month period at Heron reef on the southern Great Barrier Reef. Hard coral cover and macroalgal density showed distinct spatio-temporal variations, both within and between zones. Broad hard coral cover was significantly higher at the reef slope sites compared to the lagoon and was not significantly influenced by season. The composition and biomass of macroalgae increased in spring and declined in summer, with maximum macroalgal abundance corresponding with average temperatures of between 22 and 24°C and average 24 h PAR of 300–500 μmol qanta m−2 s−1. Changes in macroalgal biomass further influenced the composition and frequency of coral-algal interactions, however the incidence of coral-algal contact was best explained by coral cover. The results presented here emphasize that natural levels of macroalgae and coral-algal interactions are context-specific, and vary not only with-in zones, but in somewhat predictable seasonal cycles. Further, these results emphasize that the frequency of coral-algal interactions is dependent on hard coral, not just macroalgal cover, and an increase in coral-algal interactions does not necessarily translate to degradation of coral reefs. Many coral reefs are shifting away from coral dominance to assemblages that include macroalgae (Pandolfi et al., 2003; McManus and Polsenberg, 2004; Hughes et al., 2007). As a result, investigations into the drivers of coral-algal phase shifts have focused on disturbed ecosystems, where anthropogenic stressors (i.e., overfishing, eutrophication) are contributing to the proliferation of macroalgae and an increase in coral-algal competition (Hughes, 1994; Burkepile and Hay, 2006; Hughes et al., 2007; Littler and Littler, 2007; Smith et al., 2010). In order to understand the effects of human impacts, it is first necessary to understand how macroalgae respond to natural processes and to include more dynamic indicators of reef condition, such as coral-algal interactions (Connell et al., 2004; Bruno et al., 2014; Flower et al., 2017). Very few studies, however, have investigated natural drivers of the spatio-temporal dynamics of macroalgal biomass and its effect on coral-algal competition in the absence of anthropogenic influence (Bruno et al., 2014; Sangil and Guzman, 2016). The natural state of macroalgae varies in space and time due to a combination of biotic (i.e., competition and herbivory) and abiotic (i.e., wave action and temperature) processes (Steneck and Dethier, 1994; Connell et al., 2004; Bruno et al., 2014). Spatially, macroalgae display distinct within and between reef patterns in biomass and community composition (Diaz-Pulido et al., 2007; Wismer et al., 2009). Macroalgae also show marked seasonal dynamics, primarily due to strong seasonal oscillations in temperature and light (Glenn et al., 1990; Ateweberhan et al., 2006; Fulton et al., 2014). The effects of spatio-temporal variability on tropical macroalgae, however, have mostly been inferred from the occurrence of seasonal peaks and have principally focused on large, conspicuous species (i.e., Sargassum) that bloom in the austral summer (Vuki and Price, 1994; McCook, 1997; Lefèvre and Bellwood, 2010). Comparatively, little is known about a large proportion of macroalgae, which predominantly grow in the austral autumn, winter and spring (Price, 1989; Rogers, 1996, 1997; Schaffelke and Klumpp, 1997). Furthermore, environmental factors do not operate independently, and investigations into how temperature and light interact to influence macroalgal seasonality have been less clear (Mathieson and Dawes, 1986; Fong and Zedler, 1993; Ferrari et al., 2012). One apparent consequence of an increase in macroalgal abundance is a shift in the intensity of coral-algal competition (Connell et al., 2004; Diaz-Pulido et al., 2009; Haas et al., 2010). Competition between coral and macroalgae for limiting resources (i.e., space and light) can lead to reductions in coral growth and survival (Tanner, 1995; Clements et al., 2018), which have serious implications for the structure and function of coral reef ecosystems. An increase in macroalgal abundance leads to an increase in coral-algal interactions (Hughes, 1989, 1994; Bonaldo and Hay, 2014). Understanding how natural seasonal shifts in macroalgae influence the composition and frequency of coral-algal contact is critical for reef management (i.e., macroalgal removal programs), but remains unexplored. Heron reef (23.442°S, 151.914°E), a platform reef located ~50 km off the coast of Queensland in the Great Barrier Reef (GBR), represents a unique location to study natural variation in macroalgae and coral-algal interactions for several reasons. The high-latitude and offshore location within the GBR Marine Park indicate that seasonal fluctuations are pronounced and major anthropogenic influences such as overfishing and water quality degradation (i.e., sedimentation, eutrophication) are comparatively minor (De'ath et al., 2012). The southern, offshore reefs were the least affected GBR region from the cumulative footprint of the last three major coral bleaching events (Hughes et al., 2017), and since 1992, have experienced only one major damage-inducing cyclone in 2009 (Connell et al., 1997; Woolsey et al., 2012). Within Heron reef, specific geomorphological zones include a gamut of naturally variable benthic communities subject to distinct diel and seasonal changes in seawater conditions (Phinn et al., 2012; Georgiou et al., 2015). As such, Heron reef is an ideal ecosystem to explore the influence of natural environmental drivers on fluctuations in benthic cover and coral-algal interactions across a complete reef system. 1. 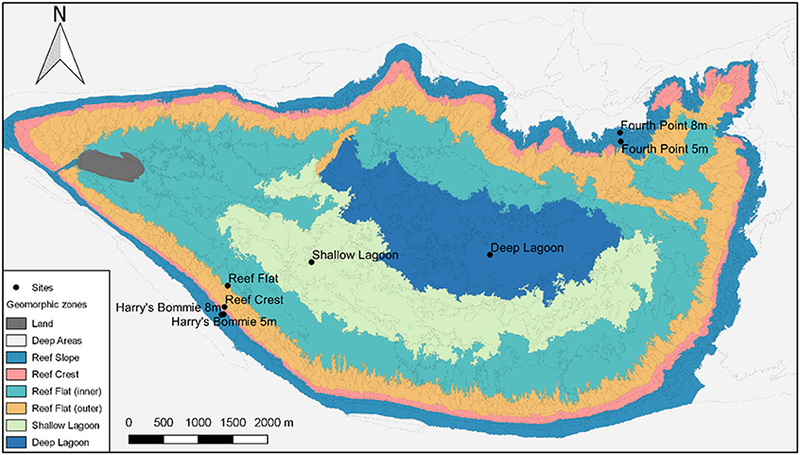 Benthic community composition is expected to vary across geomorphological zones, with higher coral cover and lower macroalgal cover on the reef slope compared to the lagoon. 2. The abundance of macroalgae, rather than coral cover, is expected to fluctuate seasonally. 3. Commoner species are expected to have more coral-algal interactions than rare species, and because coral is expected to vary by zone, and macroalgae by season, the frequency of coral-algal interactions is expected to vary by zone and season. 4. Since competition for space only occurs between neighbors, greater coral-algal interactions are expected to occur when abiotic substrate is limited and hard coral and/or macroalgal cover is high. Surveys were performed at Heron Island, southern Great Barrier Reef across the 23-month study period between January 2015 and November 2016. To measure seasonal variation, a total of eight expeditions were undertaken representing each austral season twice. Eight sites were chosen to encompass the distinct geomorphological habitats of Heron reef (Phinn et al., 2012) (Figure 1). Four reef slope sites were selected at two different depths (5 and 8 m) on the northeast and southwest of Heron reef: Fourth Point 5 m (F5), Fourth Point 8 m (F8), Harry's Bommie 5 m (H5), and Harry's Bommie 8 m (H8) (Figure 1). The northeast of Heron reef is the exposed side, subject to extreme wave forces during cyclones, whereas the southwest rim is sheltered from waves generated by both the SE trade winds and extreme wave action of cyclones by Wistari reef (Bradbury and Young, 1981; Connell et al., 1997, 2004). The northeast study area is the only area investigated located outside of the Marine National Park management zone, where fishing is permitted. One site was selected on the reef crest (Reef Crest, RC), and within the lagoon, three sites were chosen [Reef Flat (RF), Shallow Lagoon (SL), Deep Lagoon (DL)] (Figure 1). The lagoonal study area is shallow and periodically isolated at low tide, resulting in extreme diel fluctuations in seawater conditions (Kinsey and Kinsey, 1967; Potts and Swart, 1984; Georgiou et al., 2015). Figure 1. Geomorphic zones of Heron reef, southern Great Barrier Reef. Surveyed sites are indicated by name. Map data provided by Phinn et al. (2012). Benthic community composition and frequencies of coral-algal contact were recorded using the method described by Brown et al. (2017). At each site, 3 × 15 m transects were established coursing north, east and west from a central reference point. Benthic community composition was measured by recording percent cover from thirty 0.25 m2 quadrats per transect in situ, totalling 90 quadrats per site. Benthic community composition was determined from 22 categories, with the four central categories consisting of hard coral, other invertebrates, macroalgae, and abiotic substrate. Commonly encountered coral families were chosen, representing a range of growth forms: Acropora-Isopora (ACR-ISO, including tabular/corymbose/branching/columnar varieties); Montipora (MON); Pocilloporidae (POCI); Poritidae-massive (PORM); Poritidae-encrusting/plating varieties (PORE); Poritidae-branching (PORB); Favidae-Lobophyllidae (FAV-LOB); and other hard corals (including non-scleractinian corals). Macroalgae were differentiated as: fleshy macroalgae (i.e., Sargassum, Laurencia intricata), Halimeda, turf algae/cyanobacteria assemblages, and articulate/crustose coralline algae (ACA/CCA). Turf algae/cyanobacteria assemblages were distinguished as macroscopic assemblages that were generally >3 mm in height (Birrell et al., 2005). “Other invertebrates” included organisms such as soft corals, giant clams, sea cucumbers, and all other invertebrates (i.e., sponges, ascidians). “Abiotic substrate” was divided into sand/sediment, coral rubble, recently dead hard coral, and “bare” rock (i.e., epithetic algal community with turf height <3 mm) (see definitions in Brown et al., 2017). Along the same transects, a 1 m belt (0.5 m on either side) of the transect line was examined and any coral colonies physically touching macroalgae were documented (Brown et al., 2017). A single coral colony (i.e., corals with more than one corallite) could be involved in multiple competitive interactions with different macroalgal taxa or groups (Swierts and Vermeij, 2016). The types of interacting corals and macroalgae were recorded to genus level, with the exception of cyanobacteria, turf algae, and crustose coralline algae, which generally cannot be identified to genus level in situ (Steneck and Dethier, 1994). To calculate the frequency of coral-algal contact, all coral colonies occurring along a transect, regardless of macroalgal contact, were counted. The total number of interactions per coral colony, allowing for multiple interactions per coral colony, was then determined by site and season by dividing the number of coral-algal interactions by the total number of coral colonies occurring per transect (i.e., number of interactions per coral). 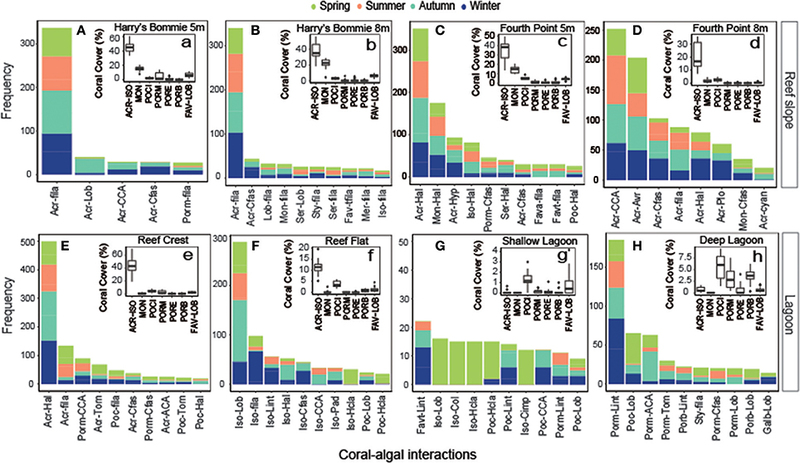 To calculate the most frequently encountered coral-algal interactions at each site, the five most abundant coral-algal interactions were established in each season. To visualize differences in interacting macroalgal taxa or groups by site and season, the total number of interactions were summed by macroalgal taxa or groups and divided by the total number of observed interactions so that the sum of all macroalgal components was 100%. Variation in seawater temperature (°C) and irradiance (μmol quanta m−2 s−1) were monitored continuously from July 2015 to November 2016 (Figure S1). Seawater temperatures were measured hourly, and photosynthetic active radiation (PAR) were integrated over hourly intervals at all sites by use of Conductivity Temperature Depth units (CTD; SBE 16plus V2 SEACAT) fitted with an auxiliary PAR sensor (Satlantic/ECO-PAR sensor, WET Labs). At Fourth Point 8 m, seawater temperature (HOBO Pendant UA-001-64, Onset) and PAR (Odyssey PAR sensor, Dataflow Systems Ltd) were recorded using other sensors. All PAR sensors were fitted with copper coating to prevent biofouling, cleaned in situ at least monthly, and removed every 3 months to clean thoroughly, exchange batteries, and download the data. Statistical analyses were conducted using R version 3.3.2 software (R Core Team, 2014), and plots were produced using the package ggplot2 (Wickham, 2016). Differences in benthic community composition and coral-algal interaction composition were analyzed using permutational MANOVAs (PERMANOVA), with the fixed effects of site and season using the adonis function in the vegan package. Resemblance matrices were obtained using Bray-Curtis dissimilarity and 9,999 permutations. Significant PERMANOVA results were explored by running separate two-way ANOVAs on explicit benthic categories. Differences in the frequency of coral-algal contact were also explored using a two-way ANOVA. The categorical factors contained the following levels: season (spring, summer, autumn, winter) and site (H8, H5, RC, RF, SL DL, F5, F8). Transects were used as replicates. Data were tested and met the assumptions for homogeneity of variance (Levene's test) and normality of distribution (Normal Q-Q plots). Significant interactive effects were followed by pairwise comparison with Tukey post-hoc tests. All generalized additive models (GAMs) were applied to data sets using the package mgcv (Wood, 2006). In all models, the number of knots were restricted (k = 4) to produce conservative models and avoid overfitting. To quantify the response of the frequency of coral-algal contact to benthic cover, three GAMs were fit using hard coral, macroalgae, and abiotic substrate as predictor variables. 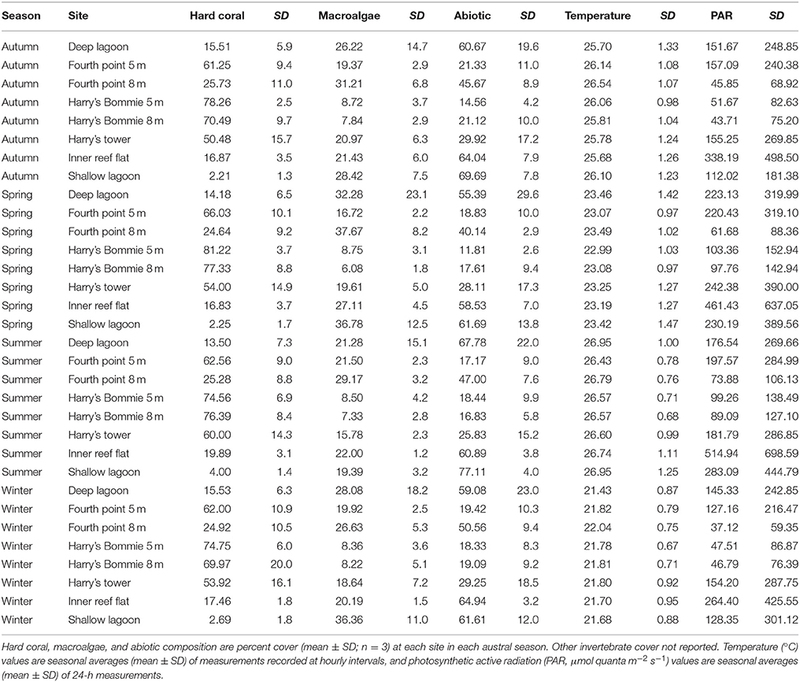 To explore the response of macroalgal abundance to seasonal changes in environmental conditions, we fit all possible model combinations using seasonally averaged temperature (°C; mean of hourly measurements) and PAR (μmol quanta m−2 s−1; mean of 24-h measurements) as predictor variables (Table 1). Cyclic penalized cubic regression splines (cc) and tensor product interactions (ti) were chosen as the smoothers for the separate covariates and interactions terms, respectively. The model requires interaction terms because the combined effect of both predictor variables differs from their separate effect (Wood, 2006). The model structure was developed using a stepwise procedure: temperature was added first, followed by irradiance, and finally the interaction term (Yi et al., 2016). These models were compared using the Akaike Information Criterion Corrected (AICc). A three-dimensional “perspective” plot was generated using the vis.gam function in the mgcv package. Table 1. Average benthic community composition, temperature and irradiance by season and site from Heron Island, southern Great Barrier Reef. Benthic community composition was significantly influenced by both site [PERMANOVA, F(1, 167) = 58.37, p < 0.0001] and season [PERMANOVA, F(1, 167) = 2.105, p = 0.039]. Broad hard coral cover was significantly higher at the reef slope sites compared to the lagoon and was not significantly influenced by season (Table 2). Specific hard coral functional groups showed distinct spatial patterns, but not seasonal patterns interactive or otherwise (Table 2). Acropora-Isopora was the most abundant across Heron reef, with the highest cover on the reef slope and reef crest (Table 2). Montipora was highest on the southwest reef slope and was nearly absent in the lagoon (Table 2). The family of hard coral Pocilloporidae was found at every site (Table 2). The different growth forms of the coral family Poritidae showed variable spatial patterns, with the highest density of Poritidae-branching and Poritidae-massive occurring at the Deep Lagoon; and generally low levels of Poritidae-plating/encrusting across Heron reef (Table 2). Massive corals of the families Favidae-Lobophyllidae were found at every site, with the greatest abundance observed on the southwest side of Heron reef (Table 2). Table 2. Results of the statistical analyses (two-way ANOVAs) on benthic community composition. Fleshy macroalgal cover varied by both site and season, with the highest cover observed in the lagoon and in spring (Table 2, Figure 2). Halimeda cover varied by site, with significantly higher cover on the north side of Heron reef (Table 2, Figure 2). The cover of crustose/articulate coralline algae (CCA/ACA) also significantly varied by site, with the highest cover observed on the reef crest (Table 2, Figure 2). Turf algae/cyanobacteria assemblages were influenced by both site and season, with cover generally highest on the reef slope and significantly lower in winter (Table 2, Figure 2). Abiotic substrate cover was highest in the lagoon and did not significantly vary with season (Table 2). Figure 2. The cover of macroalgae and the composition of macroalgal taxa or groups by season and site. (A) Percent cover (mean ± SE; n = 3) of broad macroalgal taxa or groups by season. 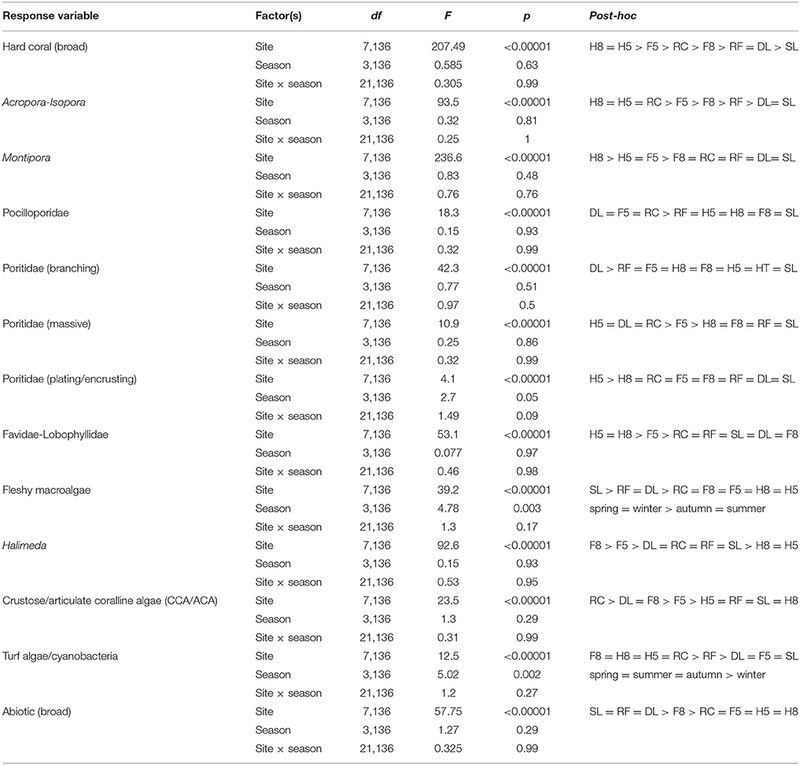 (B) Percent cover (mean ± SE; n = 3) of broad macroalgal taxa or groups by site. (C) Seasonal differences in the composition of interacting macroalgal taxa or groups. 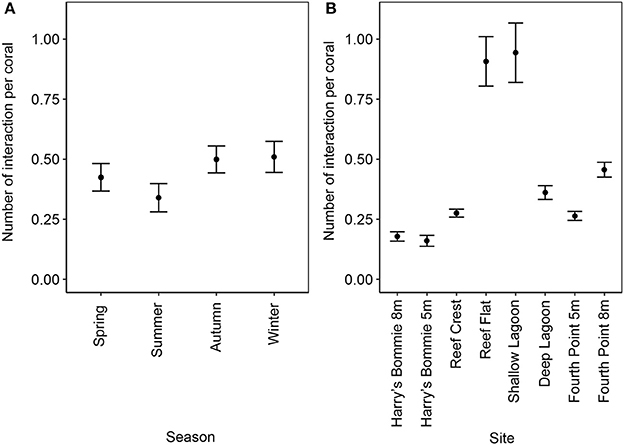 (D) Differences in the composition of interacting macroalgal taxa or groups by site. The total number of interactions were summed by macroalgal taxa or groups and divided by the total number of interactions so that the sum of all macroalgal components was 100%. AICc indicated that the best-fit GAM incorporated both temperature and irradiance to best explain macroalgal abundance. 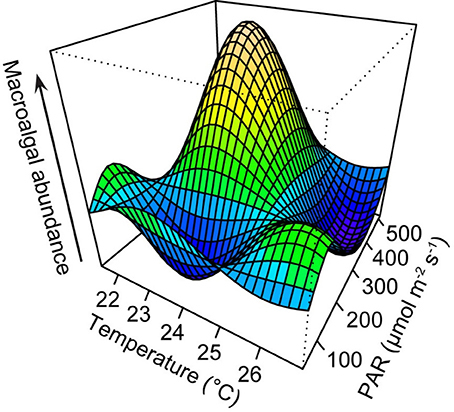 Maximum macroalgal abundance corresponded with average temperature of between 22 and 24°C and average 24 h PAR of 300–500 μmol quanta m−2 s−1 (Figure 3). Two smaller peaks were observed when average 24 h PAR was 150–300 μmol quanta m−2 s−1 and average temperatures were ~21 and ~26°C. At the warmest observed temperature (~26°C) and highest observed light intensity (24 h PAR: 400–500 μmol quanta m−2 s−1), macroalgal abundance was lowest (Figure 3). Figure 3. Three-dimensional graphic output from generalized additive model (GAM) with temperature and irradiance as predictors of macroalgal abundance. Temperature (°C) values are seasonal averages of measurements recorded at hourly intervals, and photosynthetic active radiation (PAR, μmol quanta m−2 s−1) values are seasonal averages of 24-h measurements. Plot was generated using the vis.gam function in the mgcv package (Wood, 2006). The frequency of coral-algal contact was highest at the Reef Flat and Shallow Lagoon [ANOVA, F(1, 160) = 26.9, p < 0.00001, post-hoc: SL = IRF > F8 = DL > F5 = RC > H8 = H5] and was significantly reduced in summer [ANOVA, F(1, 160) = 3.42, p = 0.01, post-hoc: autumn = winter = spring > summer] (Figure 4). Figure 4. Frequency of coral-algal contact by season and site. (A) Seasonal differences in frequency of coral-algal contact (mean ± SE; n = 48). (B) Variation in the frequency of coral-algal contact by site (mean ± SE; n = 24). The total number of coral-algal interactions, allowing for multiple interactions per coral, was determined per transect and divided by the total number of corals along the transect. A total of 207 unique coral-algal interactions were observed across all transects, representing 30 coral and 21 macroalgal taxa or groups (Table S1). The composition of coral-algal interactions was significantly affected by site [PERMANOVA, F(1, 63) = 6.51, p = 0.0001] and season [PERMANOVA, F(1, 62) = 1.33, p = 0.028]. Depending on seasonal shifts in coral-algal interactions, each site could have up to 20 unique coral-algal interactions, with the 10 most abundant displayed (Figure 5). Generally, the most abundant coral taxa were the most commonly encountered coral interacting with macroalgae (Figure 5). For macroalgae, interactions with Halimeda were frequently encountered at the reef crest and northeast side of Heron reef (Figure 5). Turf algae were the most abundant macroalgae interacting with coral at southwest side of Heron reef (Figure 5). In the lagoon, frequently encountered coral-algal interactions fluctuated seasonally (Figure 5). Figure 5. Frequency of coral-algal interactions by site with inset displaying coral cover. For each site (A–H), the most frequently encountered coral-algal interactions were established, by combining the five most abundant coral-algal interactions from each season. Only the top 10 most dominant are displayed here (where applicable). Coral-algal interactions are abbreviated listing the coral first and macroalgae second. Inset (a-h) displays boxplots (minimum, 25th percentile, median, 75th percentile, and maximum; n = 24) of hard coral functional group abundance. (A–H) abbreviations: Coral: Acr, Acropora; Fava, Favia; Favt, Favites; Galb, Galaxea (branching); Iso, Isopora; Lob, Lobophyllia; Mer, Merulina; Mon, Montipora; Poc, Pocillopora; Porb, Porites (branching); Porm, Porites (massive); Ser, Seriatopora; Sty, Stylophora Macroalgae: ACA, articulate coralline algae; Avr, Avrainvillea; CCA, crustose coralline algae; Cfas, Chlorodesmis fastigiata; Cimp, Chnoospora implexa; Col, Colpomenia; cyan, cyanobacteria; fila, turf; Hal, Halimeda; Hcla, Hydroclathrus clathratus; Hyp, Hypnea; Lint, Laurencia intricata; Lob, Lobophora; Pad, Padina; Plo, Plocamium; Torn, Turbinaria ornate. a-h abbreviations: ACR-ISO, Acropora-Isopora; MON, Montipora; POCI, Pocilloporidae; PORM, Poritidae (massive); PORB, Poritidae (branching); PORE, Poritidae (encrusting); FAV-LOB, Favidae-Lobophyllidae. Relationships between the number of coral-algal interactions to hard coral cover (edf: 2.58, F = 23.21, p < 0.00001), macroalgal cover (edf: 2.89, F = 11.5, p < 0.00001), and abiotic substrate cover (edf: 1.92, F = 8.664, p = 0.0001) were non-linear and resembled parabolic, sinusoidal, and exponential decay curves, respectively (Figure 6). Hard coral cover explained 29.6% of the deviance in coral-algal interaction frequency, macroalgal cover explained 17.1% and abiotic substrate cover explained 11.6%. The greatest number of coral-algal interactions occurred when coral cover was ~50%, macroalgal cover was ~20%, and abiotic cover remained less than ~30% (Figure 6). Figure 6. The effect of benthic cover on the frequency of coral-algal interactions based on fitted parameter estimates ± 95% confidence intervals (shaded). The effect of (A) hard coral, (B) macroalgae, and (C) abiotic substrate on the frequency of coral-algal interactions. In each case, a generalized additive model (GAM) with integrated smoothness estimation was fit using the package mgcv (Wood, 2006). Tropical coral reefs worldwide are degrading due to human activities. In many cases, reef-building corals have declined and macroalgae have become more prevalent (McManus and Polsenberg, 2004). Recent work has focused on measuring macroalgal abundance in response to anthropogenic stressors (Hughes et al., 2007; Littler and Littler, 2007; Smith et al., 2010). To evaluate the effects of human impacts, however, it is first necessary to understand the effects of natural processes on reef condition (Bruno et al., 2014; Flower et al., 2017). The results presented here highlight the key observation that natural levels of macroalgae and coral-algal interactions are context-specific, and do not only vary within zones, but also within the context of well-known seasonal cycles. Distinct spatio-temporal changes in temperature and light controlled the abundance of macroalgae, with macroalgal biomass peaking in spring and decreasing in summer. Given the important role that macroalgae and coral-algal interactions play in structuring coral reef ecosystems, these results indicate that frequent reef monitoring should be encouraged within and between zones to detect potential changes and avoid a loss of important information relating to the trajectory and resilience of coral reef ecosystems. The benthic community composition varied distinctly across the geomorphological zones, which was expected (Hatcher, 1988; Phinn et al., 2012). Within the reef slope, however, differences in benthic community composition were revealed between the northeast and southwest sides of Heron reef. Regardless of depth, the southwest was characterized by very high hard coral cover (~80%) and low turf algal cover, indicating a healthy reef condition with high herbivory and low nutrients (Littler and Littler, 2007). On the northeast side, community composition varied by depth, with high hard coral cover (~60%) at 5 m and at 8 m, comparatively low and uniform branching Acropora cover (~20%), high macroalgal cover and high amounts of coral rubble. Large decreases in coral cover at Heron reef over the 40-year period from the 1960s to the 1990s have been directly attributable to the localized effects of cyclones at particular locations (Connell et al., 1997, 2004). In 2009, waves from cyclone Hamish struck the northern side of Heron reef (Woolsey et al., 2012). The reduction in coral cover and increase coral rubble observed in this study suggest that the northeast reef slope at 8 m sustained localized damage due to the cyclone's impact. The long-term study of Connell et al. (2004) indicates that recovery to ~20% coral cover on the northeast slope can occur in ~5 years post-cyclone, particularly when seeded from displaced fragments of fast-growing branching Acropora, which is consistent with these findings. In addition to reduced coral cover and increased coral rubble, macroalgal cover was higher on the northeast side of Heron reef. On both the southwest and northeast slope, fleshy macroalgal cover remained very low (<2%). The cover of the calcifying macroalgae Halimeda, however, was significantly higher on the exposed side. Halimeda is highly vulnerable to herbivory by fishes in the families Scaridae and Acanthuridae, suggesting an increase in biomass may be due to a reduction in these fish populations (Ferrari et al., 2012; Castro-Sanguino et al., 2016). Although herbivorous fish abundances were not directly measured, the northeast study area is the only area investigated outside of the Marine National Park management zone, where fishing is permitted. Furthermore, the reduction in coral cover due to cyclone damage may have led to a decline in structural complexity, further reducing fish populations (Wilson et al., 2008), and ultimately leading to a greater abundance of Halimeda. The lagoonal geomorphological zones were distinctly different from the reef slope, characterized by low hard coral cover, high macroalgal biomass and high cover of sand. Coral cover on the Heron reef flat has historically ranged between 0 and 20%, which is consistent with our observations of coral cover (~18%) (Connell et al., 2004). Although hard corals are believed to be sensitive to environmental extremes, recent studies have shown that corals are able to persist in marginal conditions of lagoon habitats (Camp et al., 2017) and increased temperature variability reduces the likelihood of coral bleaching (Safaie et al., 2018). Instead, persistently low coral cover in the Heron lagoon appears to be due to reduced coral recruitment due to the lack of hard substrate (Connell et al., 2004). In the shallow lagoon, hard substrates were present, but mostly as unconsolidated rubble banks, resulting in the lowest observed coral cover (<5%) on Heron reef (Fox et al., 2003). At the reef flat and deep lagoon, there was a greater availability of suitable stabilized substrate, giving rise to a higher abundance of corals (Morrissey, 1980). Competition for space with macroalgae may further prevent coral recruitment, with dense macroalgal populations blanketing the benthos and pre-empting coral settlement (Birrell et al., 2008). Average fleshy macroalgal cover ranged from 15 to 25% within the lagoon, which was facilitated by reduced grazing pressure due to periodic isolation at low tide (Hatcher and Larkum, 1983; McCook, 1997), reduced water movement and wave energy (Dollar, 1982), and decreased competition with reef-building corals (Diaz-Pulido and McCook, 2004). Broad macroalgal abundance showed pronounced seasonal variations, and the seasonality of macroalgae tracked closely with spatio-temporal changes in temperature and light availability. The highest cover of fleshy macroalgae was observed in shallow, lagoonal environments in spring and was significantly lower in summer. Turf algal/cyanobacteria assemblages, on the other hand, were nearly absent in the winter, reflecting a preference toward warmer temperatures (O'Neil et al., 2012). Field observations were further supported by the modeled abundance of macroalgae using temperature and irradiance as predictors. Moderate temperature and high light, corresponding to spring temperature and shallow reef flat habitats, gave rise to the greatest macroalgal biomass. The lowest abundance of macroalgae was observed when both temperature and light were highest, corresponding with summer temperatures and high light environments. While seawater temperature and light have long been considered important drivers of macroalgal seasonality, the relationship between the two variables has been unclear (Mathieson and Dawes, 1986; Fong and Zedler, 1993). These results yield a unique perspective on the interaction of light and temperature on macroalgal abundance, revealing a complex, non-linear response across environmental gradients. Further, these findings emphasize that natural levels of macroalgal abundance are context-specific, and vary not only within zones, but in somewhat predictable seasonal cycles. When investigating macroalgal abundance, both spatial and seasonal variability must be considered, particularly as seasonality in macroalgal abundance can impact a reef's trajectory and resilience (Diaz-Pulido et al., 2009). In addition to macroalgal cover, the composition and frequency of coral-algal interactions showed distinct spatio-temporal variation. Commoner species are expected to have more interactions than rare species (Connell et al., 2004). On the reef slope, Acropora was the most abundant coral genera, resulting in the greatest number of interactions with macroalgae. On the southwest side of Heron reef, the most widespread interaction was between Acropora and turf algal assemblages. Many of these interactions were algal lawns cultivated by territorial damselfish (i.e., Stegastes sp. ), whose aggressive behavior can reduce grazing pressure and allow dense turf algal mats to persist (Potts, 1977; Bruno et al., 2014). While these interactions were frequently observed, a very small proportion of other coral-algal interactions were encountered and the incidence of coral-algal contact was the lowest on all of Heron reef. On the northeast side of Heron reef, the frequency of coral-algal contact was significantly higher, with a greater diversity of coral-algal interactions principally driven by interacting macroalgal taxa or groups. Interactions with Halimeda were common, reflecting the significantly higher abundance of this macroalga in the study area. Although fleshy macroalgal cover remained very low (<5%), interactions between four genera of fleshy macroalgae, Plocamium, Hypnea, Avrainviella, and Asparagopsis, were principally encountered on the northeast reef slope at 8 m. These taxa were observed selectively growing at the bases and among the branches of Acropora colonies, suggesting these interactions were occurring more than expected. The unique habitat within the Acropora canopy may provide refuge from herbivores or a reduction in water movement and in doing so, limit the ability of these macroalgal taxa to grow beyond the branches of the coral (Hay, 1986; Jompa and McCook, 2003b; Castro-Sanguino et al., 2016). The composition of coral-algal interactions in the lagoon differed considerably from the reef slope. Commonly observed lagoonal taxa Isopora, Pocillopora, and Porites were the most abundant in the reef flat, shallow lagoon, and deep lagoon, respectively (Morrissey, 1980; Tanner, 1995). Similar to the reef slope, the dominant coral taxa were coral species that most frequently interacted with macroalgae. Unlike the reef slope, however, the composition of interactions in the lagoon varied seasonally, reflecting a seasonal shift in the macroalgal community. Several macroalgal taxa were observed interacting with corals only in the lagoon including fleshy macroalgal taxa Turbinaria, Sargassum, Padina, and Lobophora, which is consistent with previously reported spatial variation (Tanner, 1995; Rogers, 1997; Diaz-Pulido et al., 2007). A subset, Hydroclathrus, Colopomenia, Chnoospora, and Dictyota, were observed predominantly in spring, reflecting their ephemeral seasonality (Price, 1989; Rogers, 1997; Schaffelke and Klumpp, 1997; Diaz-Pulido et al., 2007). 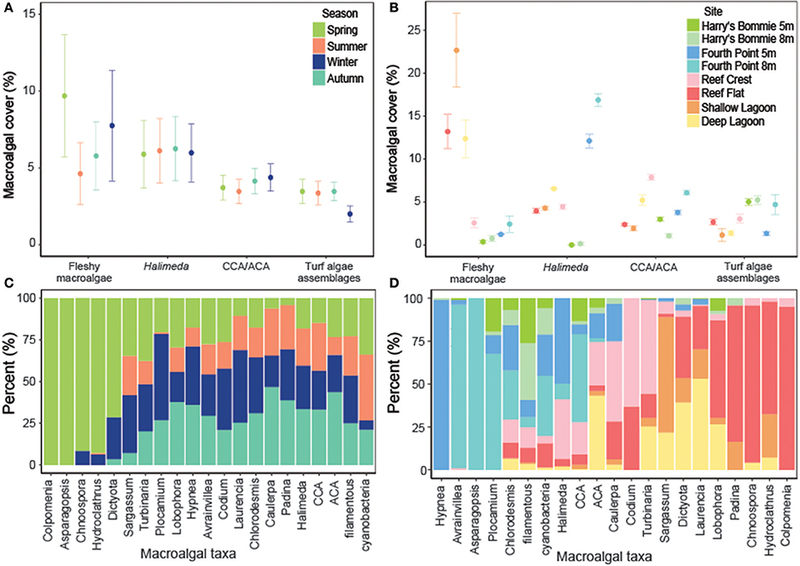 These results highlight the unique seasonality of macroalgal taxa, even within the same functional group, and demonstrate that shifts in macroalgal taxa influence the composition of coral-algal interactions. Future studies should consider the seasonality of individual macroalgal taxa when investigating coral-algal competition. While on modern reefs it is believed that an increase in coral-algal interactions is synonymous with processes associated with reef degradation (Smith et al., 1981; Lewis, 1986; Hughes, 1989, 1994; Bonaldo and Hay, 2014), the highest frequency of coral-algal interactions observed here were associated with healthy, spatially heterogeneous coral reef assemblages. Since competition for space takes place only between neighbors, coral-algal interactions would be expected to occur more often when abiotic space is low (Brown et al., 2017) and coral (Connell et al., 2004) or macroalgal cover are high (Smith et al., 1981; Lewis, 1986; Hughes, 1989, 1994; Bonaldo and Hay, 2014). Our results show that the greatest number of coral-algal interactions on Heron reef occur when coral cover is ~50%, macroalgal cover is ~20%, and abiotic cover remains less than ~30%. Even though macroalgal abundance fluctuated naturally from as low as 1% to as high as 60% cover, an increase in macroalgal cover over 20% did not translate into an increase in coral-algal interactions, which is similar to some previous studies (Jompa and McCook, 2003a; Brown et al., 2017) and in contrast to others (Smith et al., 1981; Lewis, 1986; Hughes, 1989, 1994; Bonaldo and Hay, 2014). Instead, coral cover was the best predictor of the coral-algal interaction frequency. When coral cover was low (<25%), there were fewer coral-algal interactions. This reduction in coral-algal interactions corresponded with an increase in both macroalgae and abiotic substrate cover, suggesting less coral-algal interactions indicate reduced coral cover. When coral cover was very high (>70%), however, there were also fewer coral-algal interactions. As coral cover increases over ~50%, the number of coral-coral interactions increases exponentially (Connell et al., 2004), suggesting that when coral cover is high, interactions between corals themselves is the principle form of competition. These results emphasize that the frequency of coral-algal interactions is dependent on the abundance of hard coral, not just macroalgal cover, and an increase in coral-algal interactions does not necessarily translate to degradation of coral reefs. Macroalgae and their interactions with corals are more relevant than ever, especially given the rapidly shifting tropical coral reef ecosystem dynamics. Ideally, reef-monitoring will take place during the same time of year and at the same location. Due to logistical constraints (i.e., weather, financial), however, coral reef monitoring often occurs in response to a disturbance and rarely ever considers seasonal and spatial variability. The results presented here emphasize that natural levels of macroalgae and coral-algal interactions are context-specific, and vary not only with-in zones, but in somewhat predictable seasonal cycles. Variation in temperature and light play a key role in the abundance of tropical macroalgae, and future work should explore to what extent these thresholds are reached at large spatial scales to improve quantitative models of the biomass of macroalgae on coral reefs. The complexity of macroalgal and coral-algal dynamics across this one reef system further highlight the need for future studies to consider inter-seasonal variability across zones and illustrate the difficulty in determining the baseline condition of well-studied ecosystems. Now more than ever, seasonal and long-term studies are needed to avoid a loss of important information associated with the trajectory and resilience of coral reef ecosystems. The datasets generated/analyzed for this study can be found as an electronic notebook on (https://github.com/imkristenbrown) with scripts available through https://github.com/imkristenbrown. KB, DB-C, AK, SD, and OH-G: designed the study; KB, DB-C, AK, RvdZ, and MA: carried out the study and collected field data; KB, DB-C, and SD: performed statistical analyses; KB: wrote the first draft of the manuscript, and all authors contributed substantially to the interpretation and final version of the paper. All authors agreed to be listed and gave final approval for publication. This work was supported by the Australian Research Council (ARC) LP110200874 (SD and OH-G), the ARC Centre of Excellence for Coral Reef Studies CE140100020 (SD and OH-G), and an ARC Laureate Fellowship FL120100066 (OH-G). It was also supported by the Holsworth Wildlife Research Endowment-Equity Trustees Charitable Foundation and the Ecological Society of Australia (KB), the PADI Foundation (KB) and a XL Catlin Seaview Survey scholarship (KB). We would like to thank the numerous volunteers for support in the field including Matheus A. Mello-Athayde, Tania Kenyon, Camille Rémond, Bonnie Lewis, Heather Middleton, Catherine Kim, and Aaron Chai, colleagues of the Coral Reef Ecosystem Laboratory, and the staff of Heron Island Research Station. Research was conducted under GBR Marine Park Authority Limited Impact Research permit #UQ008/2014c. Diaz-Pulido, G., McCook, L. J., Larkum, A. W., Lotze, H. K., Raven, J. A., Schaffelke, B., et al. (2007). “Vulnerability of macroalgae of the great barrier reef to climate change,” in Climate change and the Great Barrier Reef, eds P. A. Marshall and J. Johnson (Townsville: Great Barrier Reef Marine Park Authority), 153–192. Mathieson, A. C., and Dawes, C. J. (1986). Photosynthetic responses of Florida seaweeds to light and temperature: a physiological survey. Bull. Mar. Sci. 38, 512–524. Smith, S. V., Kimmerer, W. J., Laws, E. A., Brock, R. E., and Walsh, T. W. (1981). Kaneohe Bay sewage diversion experiment: perspectives on ecosystem responses to nutritional perturbation. Pac. Sci. 35, 279–395. R Core Team (2014). R: A Language and Environment for Statistical Computing. Vienna: R Foundation for Statistical Computing. Wickham, H. (2016). ggplot2: Elegant Graphics for Data Analysis. Houston: Springer. Wood, S. (2006). Generalized Additive Models: An Introduction With R. Boca Raton, FL: CRC press. Copyright © 2018 Brown, Bender-Champ, Kubicek, van der Zande, Achlatis, Hoegh-Guldberg and Dove. This is an open-access article distributed under the terms of the Creative Commons Attribution License (CC BY). The use, distribution or reproduction in other forums is permitted, provided the original author(s) and the copyright owner are credited and that the original publication in this journal is cited, in accordance with accepted academic practice. No use, distribution or reproduction is permitted which does not comply with these terms.